We won! Olivewood Technology are delighted to announce that our Chil-LED lighting system has won the 2015 Energy Efficient Product of the Year Lighting award. 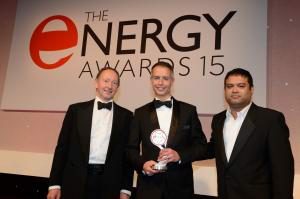 Company director and Chil-LED inventor Simon Leggett was at The Energy Awards on Wednesday night and was thrilled to win considering the strong competition. Based in the South West, lighting and software specialists Olivewood Technology spotted a gap in the market. Both traditional and LED lighting was letting in heat into cold storage spaces and valuable energy was being wasted in removing that heat. Simon Leggett got to work designing Chil-LED – a unique lighting system designed specifically to stop heat from entering cold storage space ­ making it extremely energy efficient when compared to other industrial LED lighting used in chill stores.